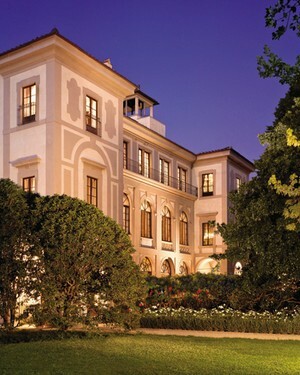 The renovated palazzo that is now the Four Seasons Hotel Firenze is its own great excuse to travel to Italy. Its centerpiece: Europe's most expensive hotel room. 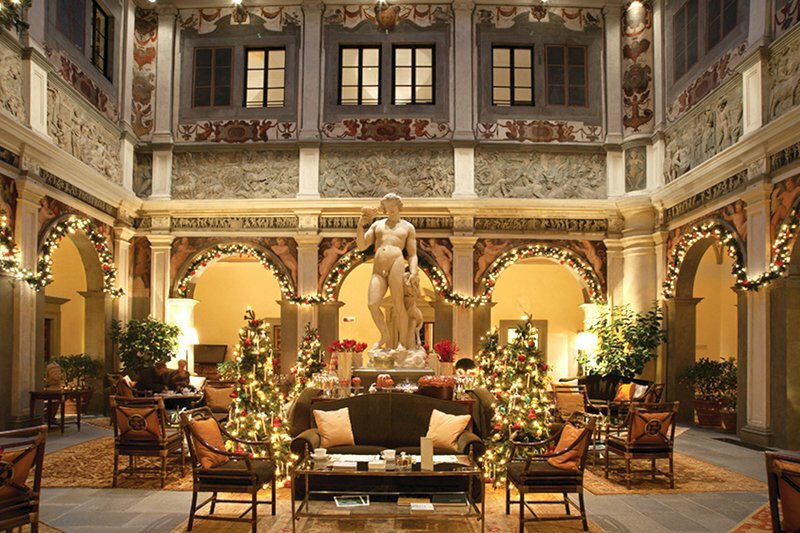 FLORENCE – I've seen a hotel or two in my day — some shabby (not anywhere near chic), some completely fabulous — but nothing could've prepared me for my recent stay at the Four Seasons Hotel Firenze, a renovated palazzo in the heart of the Renaissance city. Opened just three years ago, the property is unlike any other chain hotel I've ever visited. In the first place, it is a magnificent museum in and of itself. The 500+ year-old Palazzo della Gherardesca has been lovingly restored — right down to the original frescoed ceilings and on-site chapel — by the local Fratini family, who are often seen around the hotel on Sundays. The rooms are, of course, lovely throughout, with elegant Pedersoli linens, views overlooking eight acres of gardens. There's even a 16th-century conventino nearby. 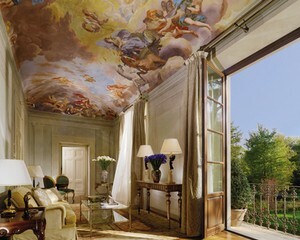 But the ultimate accommodation — by many accounts, the most expensive room in Europe — is the breathtaking Royal Suite, which runs a mere 18,500€ per night. 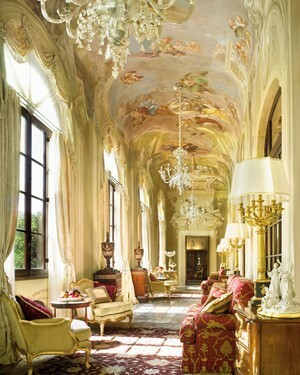 It's a baroque explosion of vaulted ceilings, endless rooms, and gilding galore. Add to this an original ceramic floor by Ignazio Chiaiese, and you could be forgiven for thinking you were a long-lost Medici in this stunning perch. The Royal Suite conveniently connects to the grand Presidential Suite next door. The ultimate house party — with park vistas and Michelin-starred room service — is only hundreds of thousands of dollars away. 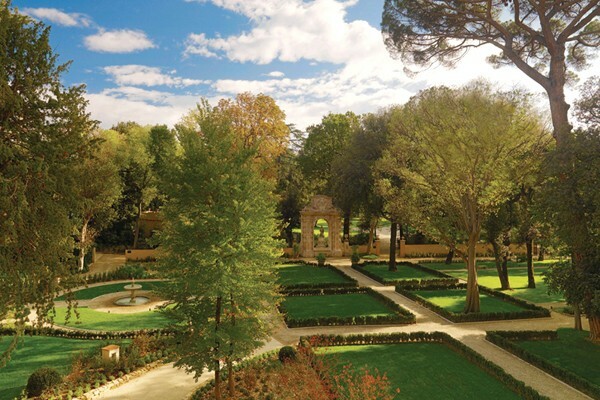 The Four Seasons Florence is a little oasis in an otherwise cobblestoned, urban setting. Lunch by the pool (yes, a pool in the middle of Florence!) is a welcome respite from sun and all those church and museum visits. And while I am not usually a fan of hotel brunches — especially in towns with wonderful trattorias — the brunch at Il Palagio is not to be missed. Reservations must be made well in advance because it's usually packed with — get this! — real Florentine families there for the buzzing atmosphere and unbelievably good food. Platters of shellfish, cheeses, made-to-order pastas, and chef Vito Mallica's signature soft-cooked egg with citrus, bottarga, capers, and Tuscan olive oil make brunch an hours-long, memory-making affair. But I'm not finished gushing. About the grand L'Orangerie lobby lounge and soaring spaces. About how history mixes with modern tech and bath amenities. I still marvel that anyone took on such a massive renovation, and that it was executed so beautifully, down to every last stucco'd detail. There's only one drawback to staying here. You might have to drag yourself out to see the Duomo.